I remember what a big deal it was. The Seattle Mariners had gotten Ken Griffey, Jr., the son of one of the players from Cincinnati “Big Red Machine”. They started him out with the Bellingham Mariners, the “Baby M’s” as they were called. His very first night with the team, he had gone 0-4. The very next night, I was up at the Everett Giants game at Memorial Stadium to see him in his second professional baseball game and you just knew he was pent up. Sure enough, in his first plate appearance, he knocked one out of the park to the cheers of the fans. Sure, this was the Giants’ home field, but we all knew we were watching the future of the Seattle Mariners. As my kids grew up, I always used Griffey and one of his amazing catches as an example of how you reach for things you may not get…but it’s in the trying that you find out. When the ball is hit out there, Griffey could have easily just thought to himself, “Well, not gonna get that!” But his first instinct was always to catch the ball. Even it was an eventual home run, the second it came his way, he was always planning to make an amazing catch. 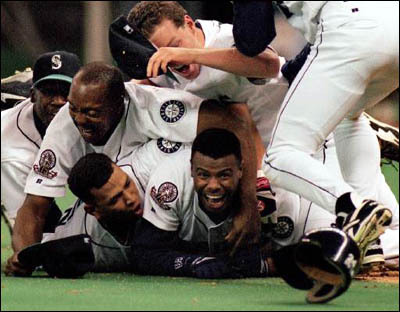 The 1995 playoff run was one of the most amazing times in this city, which has me that much more excited about the day I hope to live long enough to see: Seattle hosting a World Series. While that currently seems like eons away, Griffey’s announcement this week that he was calling it a career sent us all reminiscing about better times. In his prime, the guy was a one-man highlight reel. Even when the local news showed that final moment of the ’95 playoff game against the Yankees AGAIN for the umpeenth time, I still got goosebumps. We got so close. When you look at that ’95 team—Ken Griffey Jr., Alex Rodriguez, Randy Johnson, Edgar Martinez–I can’t figure out how we couldn’t do it, either. But if you were in Seattle at that time, you got the feeling of what baseball is all about. Yeah, Griffey’s retiring, but not after giving us a lifetime of amazing memories.